New Zealand’s first ever Floating Theatre! Set amongst beautiful outdoor surrounds, The Floating Theatre is an immersive experience of puppetry, projections and stagecraft. Conceived by Designer/Director Stephen Bain, the Floating Theatre is a riveting bond between multimedia performance and the sublime beauty of the sea! The 30-seat theatre is a completely unique mobile structure clad in fabric that floats on water and shines luminously at night. This glowing structure becomes a magic lantern that people can view from the shore, with the shadows of performers and audience dancing across its walls. Part mime, part surrealist comedy, The Floating Theatre portrays a story of fantasy and adventure! Set to an exhilarating score by Jeff Henderson, the action follows Louis on his journey of transformation and wonder - One person holds the key, but which door will it open? 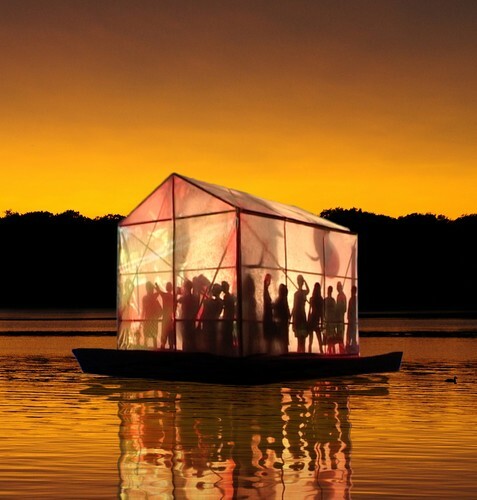 With the tinkling of music and dancing of lights, the floating theatre brings the stage to the sea. An intimate experience and outdoor spectacle from another world! Directed & designed by Stephen Bain, performed by Jeremy Randerson & Jenny McArthur, music by Jeff Henderson, props by Sarah-Jane Blake.